Santander, capital of Cantabria - Santander is a modern commercial city and one of Spain's main ports of arrival for ferry passengers from Britain. In 1941, Santander fell victim to a great fire, which burned for 2 days fanned by strong southerly winds. Only one person was killed while the city was plunged into chaos and much of the historic centre was destroyed. The oldest remaining building to be found in Santander today is the cathedral. Cantabria Holiday Attractions - Much of the tourism that comes to the region head towards the summer holiday resorts to be found along the northern coastal strip. El Sardinero near Santander is one of the most popular beaches for visitors to the capital city. It can get busy along its 1.3km length during the summer months, but the wide promenade, which is one of the prettiest in Spain, runs the whole length of the beach and there is a good supply of hotels and eateries to choose from. At one end of the beach can be found Magdalena Park, which offers a beach playground, mini zoo and train circuit. The town of Comillas has a picturesque sandy beach with plenty of parking nearby and a fishing port at one end. 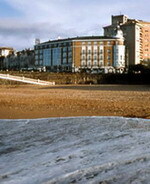 The beach at Laredo is over 4km long and has fine golden sand overlooked by a long promenade. It also offers good conditions and lifeguard facilities for those interested in surfing. Cantabria National Parks - Cantabria has many national parks for those interested in the flora and fauna Spain has to offer. 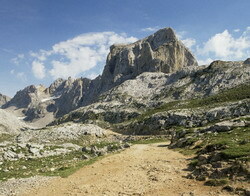 The Parque Nacional de los Picos de Europa was the first Spanish national park to receive this classification in 1935. The Picos de Europa Mountains are spread over the three provinces Asturias, Leon and Catalonia and contain 3 massifs characterised by constant rainfall and often snowfall on the peaks. The Nature Reserve offers some fantastic extremes of landscape including vertical drops of over 2km, hillside forests of oak, beech, maple and walnut trees, meadows of green pasture land and the great Covadonga lakes. This northern region of Spain is a great destination for discovering some of the natural delights of this diverse country. Beautiful beaches and dramatic sheer cliff faces dominate the coastline, while the Picos de Europa can be found just 25km from the coast. Cantabria has a good selection of Nature Reserves both within the mountainous areas and along its northern coastal stretch. With fantastic scenery and a wonderful diverse range of flora and fauna, these offer some excellent walking and hiking opportunities for visitors who want to experience the more rugged side of Spain. Castro Urdiales, a seaport of northern Spain, in the autonomous community of Cantabria, situated on the bay of Biscay. Castro Urdiales is a modern town, although its castle and parish church, Iglesia de Santa Maria de la Asuncion, date from the Middle Ages. Its chief industries are tourism, fishing, and the preservation of fish, especially sardines and anchovies, in oil. The Lolin anchovy canning factory serves as a reminder of the town's closeness to this industry and its proximity to the sea. Between 1894 and 1904 the exports of iron ore rose from 277,200 tons to 516,574 tons. Tourism has greatly increased in Castro Urdiales in the last thirty years; many people from Bilbao and other parts of the Basque Country and Cantabria as well as Northern Spain in general keep summer homes in the town. Although the number of people registered in the town is around 28,604, the summer population can double or even triple this figure.The town is popular because of its beaches and scenic harbor. Sadly, the commercial fishing industry is declining and may soon be eradicated completely. 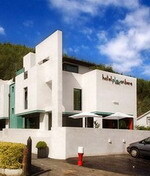 The Las Rocas Hotel is located in the fishing village and seaport of Castro Urdiales, Spain. Brazomar Beach is adjacent, and Bilbao harbour is 18 kilometres away. Castro Urdiales bus station is 500 metres away. Facing the Atlantic Ocean, the hotel is set in a modern six-storey building surrounded by a garden filled with palm trees. The modern, pastel-toned Las Rocas Restaurant serves a daily set menu which specialises in fresh, locally caught fish. The café also offers a selection of snacks, tapas, and other light dishes throughout the day. The 66 air-conditioned guestrooms have sleek modern decor and white wood furnishings. Ruesga - in a privileged location, among sea and mountains, next to Natural Park Collados del Asón (Hillocks of Asón river), only twenty minutes from the beaches of Laredo and between Santander and Bilbao city. This situation permits great variety of activities and cultural visits. There are numerous activities of active tourism that can be carried out, among others: senderismo, with a lot of routes in number and degree of difficulty; paint-ball; routes by quads, fishing, horses, going down the river Asón by canoe, aquatic sports or speleology in some of the numerous caves existing in the zone, known on a world scale. Hotel Torre de Ruesga is perfectly renovated 17th century palace which now hosts a charming hotel in a wonderful location, surrounded by pretty gardens on the banks of the river Asón. The hotel's interior features 19th century frescos by the Catalan painter, León Criach. The palace has retained the original sitting room with open fireplace and also has a snooker room, sauna and a gym. 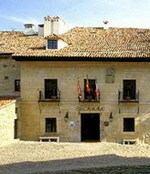 The cuisine is a blend of traditional Cantabrian and international dishes. This is a peaceful place un unwind and relax. The guestrooms are spacious and elegant, with modern fabrics, wood floors, satellite TV, radio, minibar and many little extras. 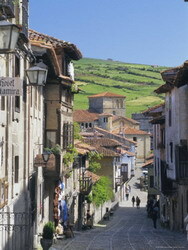 Santillana del Mar is a historic town situated in Cantabria, Spain. 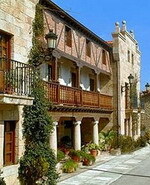 Certain features of this historical town includes Altamira Caves (Cuevas de Altamira) and many historic buildings, attracting thousands of holiday-makers every year. There is an old saying that Santillana del Mar is The Town of Three Lies, since it is neither a Saint (Santo), nor flat (llana) and has no sea (Mar) as implied by the town's name. However, the name actually derives from Santa Juliana (or Santa Illana) whose remains are in the kept in the Colegiata, a Romanesque church and former Benedictine monastery. The Hotel Casa Del Marques is housed in a renovated 16th century Gothic building with stone façade and iron-finished wood doors, set in medieval Santillana Del Mar and is the former residence of the first Marquis of Santillana. Guests can relax in the public areas of this 16th century Gothic building, which preserves some of the original features and is divided into the Ladies Hall, the Nobleman's Hall and the Reading Hall. Guests can unwind with a drink in the furnished garden and patio area or relax with a good book in the hotel library. The 14 guestrooms feature traditional French rustic-style decor with exposed brick, wood beams, cherry-wood floors and painted wood furniture. This newly built manor house conserves the typical architecture of the area, blending in perfectly with the architectural surroundings of this beautiful locale. Comfortable rooms with a pleasant atmosphere help the guest to find peacefulness and rest. The restaurant and bar, located in the Parador Santillana Gil Blas offer guests the opportunity to sample Cantabrian cuisine's most traditional dishes. We recommend you try cocido montañes (mountain stew): cabbage, beans, ribs, sausage, panceta, chorizo, black pudding all go into it. Enjoy too the grilled beef steak with Tresviso sauce, the hake in Cantabrian sauce, clams from Pedreña, the anchovy salad, the Cantabrian ventrisca (tuna) and quesada pasiega (cheesecake). 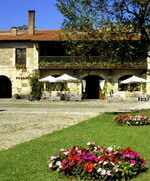 The Hotel is in the lovely mansion of the Barreda-Bracho family, in the square of Santillana del Mar, a town declared a National Monument, whose origins go back to the 7th century. The grand entrance leads to open, welcoming public spaces, with wooden floors and traditional decoration and furniture. The bedrooms are comfortable and in harmony with the overall look of the hotel. The dining room serves traditional stews, steaks, hake from the Cantabrian sea over green asparagus and quesada pasiega (cheesecake). The Emperador room is the most emblematic at the Parador and, for this reason, has hosted many famous figures such as General de Gaulle, the present emperors of Japan, etc. 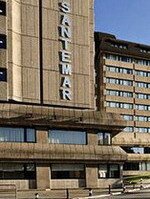 This Santillana Del Mar hotel is nine kilometres from Torrelavega and Suances and 16 kilometres from Comillas. 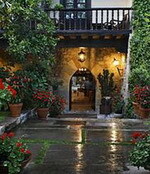 Posada Casa de Guela - Guest House serves a daily complimentary breakfast; this hotel has an outdoor pool. Guestrooms feature private bathrooms, and safes, telephones, and minibars are provided in all guestrooms. Solares is a spa town, located at 50 meters above sea level, and 0.7 kilometers from the capital of the municipality, Valdecilla. 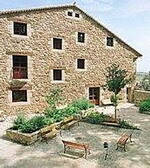 Close to the Cantabrian capital, Santander, at only 15 kilometers. 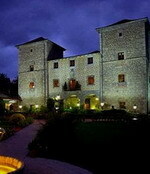 Here you can visit Pico Castillo and the Palacio de los Marqueses de Valbuena. Interesting samples of architecture of century XII can also be seen, among them particular residences like Villa Arras, and the bath complex constructed in 1827 (reconstructed recently and turned into a hotel-bath) around the spring of Fuencaliente and to the Solares water bottling plant next to the Miera river. 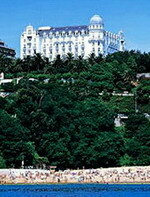 The Hotel Balneario Solares is located in the spa town of Solares, Spain, 10 kilometres from the beaches of the Cantabrian Coast and 18 kilometres from Santander. Housed in a renovated historic building with a grand white-stone façade, the Hotel Balneario Solares is a contemporary four-storey property. The 5,000 square-metre spa centre features a fitness suite, sauna, indoor pool, and a hydrotherapy pool. A range of traditional and modern beauty and therapeutic treatments are offered. 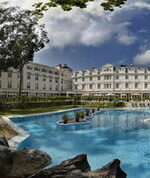 An outdoor pool can be found in the hotel gardens. 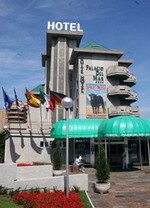 The hotel's El Manantial restaurant is decorated in a contemporary style and open daily for breakfast, lunch, and dinner. The menu offers a selection of local and international dishes. Drinks and snacks are served in the cafe-bar. Suances - A seaside town including the lovely La Concha Beach - approximately 30 kilometres from Santander. The Hotel Cuevas III is a bougainvillea-covered traditional-style country mansion situated 400 metres from La Concha beach in Suances, 30 kilometres from Santander. Guests can dine at the hotel's Covadonga Restaurant, which serves traditional Cantabrian dishes and seafood specialities in a rustic-style setting with exposed stone walls and ceramic tiled floors. Before or after a meal, guests can relax with a glass of wine in the traditional ambience of the bar, or take advantage of room service, which is available round the clock. The three-floor hotel features 62 guestrooms, all of which have terracotta decor with exposed wooden beams and antique furnishings. 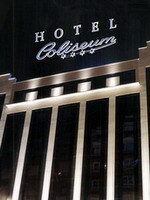 All guestrooms include balconies, work desks, satellite television, direct-dial phones, and bathrooms with hair dryers. Hotel of a modern design, located 50 metres from the beach, and one kilometre from the village centre of Suances; Santillana del Mar is seven kilometres away. Complimentary wireless Internet is accessible throughout the public areas and parking is free; express check-in and check-out are available. Hotel Playa Ribera serves a complimentary breakfast each morning. Hot tub (jacuzzi) available for guests. Hotel Playa Ribera's guestrooms offer flatscreen televisions with satellite channels and high-speed Internet access; a half-board rate is available. Torrelavega is a municipality and important industrial and commercial hub in the single province Autonomous Community of Cantabria in northern Spain. It is situated roughly 8 kilometers from the Cantabrian Coast and 27.5 kilometers from the capital of the Autonomous Community, Santander, half way between the Principality of Asturias and the Basque Country. The rivers Saja and Besaya flow through the city. It is the capital of the county of Valle del Besaya which, along with Torrelavega, is composed of the municipalities of Cartes, Los Corrales de Buelna, Cieza, Arenas de Iguña, Bárcena de Pie de Concha, Molledo, Anievas and San Felices de Buelna. Its highest point is 606 meters and its lowest point is 12 meters. 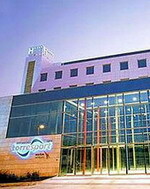 The Husa Torres Port is a modern hotel set in the quiet area of Torrelavega, 20 kilometers from Santander. Those wishing to explore the area will find the cobbled streets of Santillana del Mar, Altamira caves and the Prehistoric Museum, all within one and a half kilometers of the hotel. Guest can dine in the Sijos Restaurant, which serves local specialties with a contemporary twist in a light, bright setting. The hotel offers an array of amenities including a lounge with television and DVD player, and an indoor pool with massage area. The 66 guestrooms are decorated in bright colors with cheerful fabrics, wooden furniture, and have separate sitting areas.